Midnight Update: National appears to have held at 45° and Dulles at 44° through midnight. The preliminary high today at Washington National of 45° is 23° below average. If it holds through this evening, it will break the old record low maximum record of 51° set in 1940. This is one of the last 3 dates in the remaining portion of the year with record cool highs above 50°. The monthly record low maximum is 40° on the 23rd. THE DATE. THE PREVIOUS RECORD WAS 53 DEGREES SET IN 2002. THE DATE. THE PREVIOUS RECORD WAS 52 DEGREES SET IN 2002. THE DATE. THE PREVIOUS RECORD WAS 52 DEGREES SET IN 1977. INTL AIRPORT NC TODAY. THIS BREAKS THE OLD RECORD OF 57 SET IN 1945. AIRPORT NC TODAY. THIS TIES THE OLD RECORD OF 53 SET IN 2002. A statement has not yet been issued by the National Weather Service, but the high of 49° at Washington Dulles was also a record, easily beating the 55° in 1978. Just in time for Blog Action Day's focus on climate, NOAA's National Climatic Data Center earlier this afternoon released its preliminary analysis of global climate for September 2009. The combined land and sea surface temperature was the second warmest September on record, 0.62°C (1.12°F) above the 20th Century average of 15.0°C (59.0°F). The September average was only 0.04°C (0.07°F) below the 2005 record. This is now the 33rd consecutive September since 1976 with an above-average temperature. The land surface temperature was also the second warmest for September, and the sea surface average was tied with 2004 as the fifth warmest. Warm ocean temperatures were widespread, with the Southern Ocean near Antarctica and the Gulf of Alaska the major exceptions. 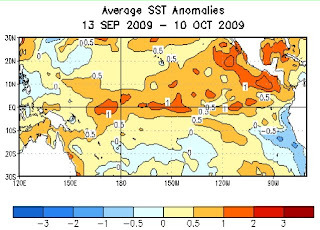 A weak El Niño persisted across the tropical Pacific. For the year to date, the combined land and sea average is the sixth-warmest January to September period on record. Regionally, Canada, Europe, the northern and western contiguous U.S., eastern Brazil, and most of Asia and Australia were warmer than average. The warmest departures from average occurred in Canada, the northern and western contiguous U.S., western Russia, and parts of Australia, where temperature anomalies ranged from 3-5°C (5-9°F) above the 1961-1990 average. For the contiguous 48 states, the U.S. average was the 32nd warmest on record. Temperatures were particularly warm in the West, where the region as a whole, as well as the states of California and Nevada, had their warmest September on record. 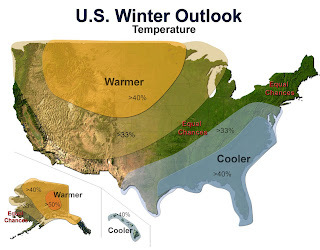 NOAA's Climate Prediction Center this morning issued its outlook for winter 2009-10 (December-January-February) in the U.S. It calls for a strengthening El Niño in the central and eastern tropical Pacific to dominate weather patterns for much of the country. The relatively warm Pacific water temperatures are expected to affect tropical rainfall distribution and in turn influence the strength and location of the storm track over North America. The temperature forecast includes warmer than average temperatures over much of the West and central and northern Midwest. The best chance (over 40%) of warmer-than-average temperatures is from the northern Rockies eastward to Minnesota and as far south as Colorado and Nebraska. Temperatures are expected to be cooler than average from southern Texas northeastward to the Mid Atlantic area, including the Southeast. The Washington, DC region is on the borderline between the areas for over 33% chance (Maryland) and over 40% chance (most of Virginia) of cooler than average temperatures. The highest probability (over 40%) of cool temperatures is in the Southeast, from Virginia southward to Florida and westward along the Gulf Coast. Precipitation is expected to be heavier than average along the central and southern West Coast eastward along the southern border and Gulf Coast through Florida. The wettest areas are likely to be most of California, central and southern Texas, and Florida. The driest areas relative to average are predicted to be the Pacific Northwest eastward across the northern Rockies and also from the northern Gulf States northeastward through the Ohio and Tennessee Valleys to the eastern Great Lakes. This seasonal outlook does not predict where and when snowstorms may hit or total seasonal snowfall accumulations. Snow forecasts are dependent upon winter storms, which are generally not predictable more than several days in advance. DEGREES WHICH HAD BEEN SET IN 2006. SET A NEW RECORD LOW MAXIMUM. DATE. THE PREVIOUS RECORD WAS 36 DEGREES SET IN 1935. 35 WAS 2 DEGREES ABOVE THE OCTOBER 10 RECORD OF 33 SET IN 1919. TODAY. THIS BREAKS THE OLD RECORD OF A TRACE SET IN 2006.
INTERNATIONAL AIRPORT IN THE TWIN CITIES MN TODAY...OCTOBER 12 2009. THIS BREAKS THE OLD RECORD OF 2.0 INCHES SET IN 1959. MEASURED AT MSP INTERNATIONAL AIRPORT. A new study published in the latest issue (October 8) of Science Express, the online version of Science magazine, has extended the history of CO2 levels back as far as 20 million years ago. The results indicate that current atmospheric CO2 concentrations of about 385 parts per million (ppm) are equivalent to the highest in that entire interval. Previous analyses of air bubbles trapped in ice cores had shown that CO2 levels varied between 180 and 300 ppm over the last 800,000 years. The new technique uses the ratio of boron to calcium in the shells of fossil marine algae. It was calibrated by comparing its results to the measurements from ice cores. 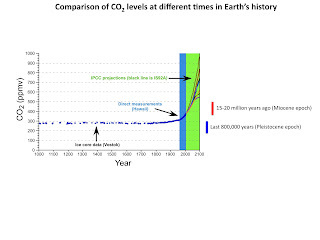 The new data show that during the Middle Miocene period from 14 to 20 million years ago, the CO2 level was around 400 ppm, very close to today's readings. The measurements have an average error of 14 ppm. During the Middle Miocene, global average temperatures were 5 to 10°F warmer than today. Sea levels at the time were about 75-120 feet higher than today, and there was no permanent ice cap in the Arctic.